Two months back, I wrote about my friend’s concept of waiting for the universe to show up, the idea that when we want something we must work our hardest to meet the universe in the middle (or sometimes try extra hard to meet the universe at its doorstep). He visited last weekend and we celebrated together our new jobs–I’ve been at mine for almost two months now and he has been at his about double that. He very excitedly told me how he turned what was supposed to be a temporary, contract position into a full-time job. He worked hard to meet the universe. I’m excited to announce that I’ve been doing some work myself over the last year to lay some offerings down at the feet of the universe (in my mind, I picture the universe as a wise and regal Cate Blanchett). As I talked about on this blog years ago when I was in Portland, my former graduate program at Portland State University houses its own publishing house, Ooligan Press. Last year, I submitted my collection of short stories to their acquisitions department. After some time reviewing and some work on my own part editing the stories, they acquired my collection at the end of April. This news came as I was on vacation in New Orleans between leaving my old job and starting my new one–basically, the most blissful time for me to receive such important news. As I wandered the mostly empty, rain-soaked streets of the French Quarter with one of my best friends, I found out that the universe showed up for me in a big way. My debut short story collection, Siblings, will be published in the fall of 2016–this seems simultaneously close and far away. I will be the first alum of the program to have a full-length book published by Ooligan Press. Reading at the Living Gallery. Yesterday, I was invited back to read at the Popsickle Literary Festival. 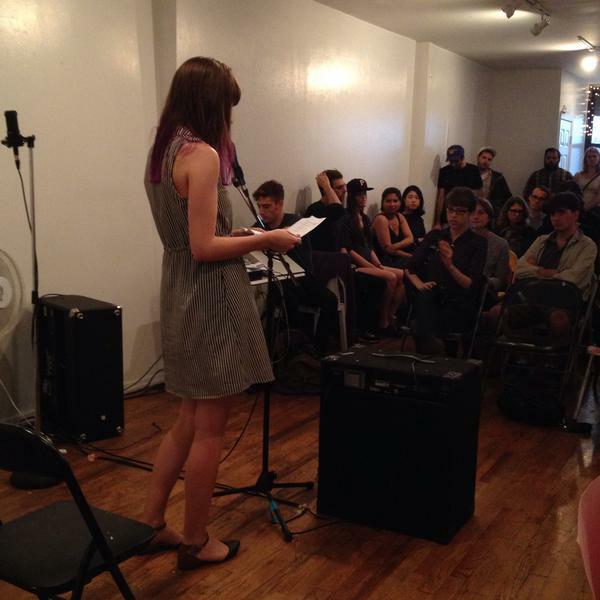 It was my second time appearing, this time on behalf of The Bushwick Review. What made this event particularly special, was that my project manager at Ooligan Press (the person who will care for and shepherd my manuscript through all the departments on its long journey to publication) happens to be living in New York for the summer and met me for the first time at my reading. We went out for drinks after and chatted excitedly about preliminary plans for the book (hopefully a lot of readings up and down the West Coast). There will be much more to come as I talk about my experiences publishing my first collection, from what it’s like working with an indie press (my favorite kind of press) to going from being the publicist for other people’s books to trusting others in that role. My book’s release date is still over a year away, but I’m excited for the long road that will take me there. I set out in 2015 to make this my “Year of Yes,” in which I would say yes to as many possibilities and experiences in my life. I didn’t expect that one of them would be this, but I’m thankful that the universe decided to say yes with me. Woo hoo so proud of you sissy poo!!!! !